Two call-offs (for the Friday and Saturday) later, I was even more desperate to climb on an even more thawy forecast and convinced that high on the Ben might be the only really viable option, but simultaneously encouraged by Guy Steven’s Friday report that the long-coveted classic Green Gully might still be on if it hadn’t been cut to pieces by everyone and his dog over the previous two days. So Jamie Hageman and I agreed to get out early on Sunday for a look with the notion of getting to the route first if everyone and his dog still had the same idea, but think we were ultimately the only team on it all day. And we really couldn’t commit to more than just ‘a look’ at first, with both the deteriorating conditions and my answer to Jamie’s question about how many Grade IVs I’d led (‘none yet but I won’t try it if I don’t like what I see!’) in mind. 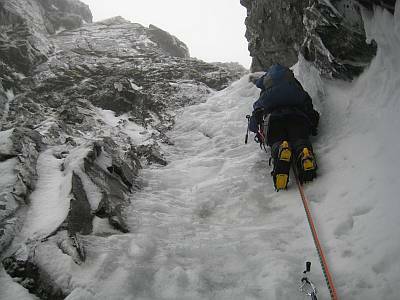 And we might well have bailed out and headed off in search of something else with the last ten metres or so of steep snow up to the peg belay at the foot of the gully collapsing under body weight and becoming ever steeper as I kicked it away. But, after belaying to two in-situ pegs, throwing a rope to Jamie, stepping rightwards over some soggy ice to something better and running it out to a handy cluster of four in-situ pegs with pink tat at the top of the first pitch, I no longer had any real doubts that it was on. 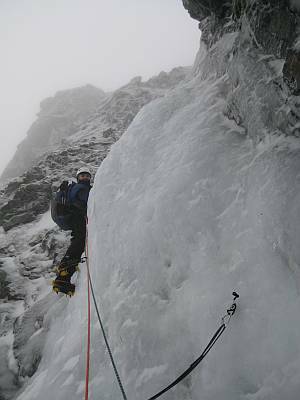 Another relatively easy pitch on mostly reasonable snow followed to (I think) two in-situ pegs on the right wall (to which I added a screw that was starting to melt out by the time Jamie arrived) below the first obviously steep ice of pitch 3. And here I placed a further two screws before arriving at another straightforward section leading to the foot of the crux icefall, where yet another mirage of ‘imaginary big ledge turning out to be cramped belay with kicked stance on steep snow’ saw me belayed to a tricam and lost arrow of my own and debating whether or not this was The Pitch. See, I’d latched on to the fourth pitch description from Godefroy Perroux’s guide which starts 20m, climb a fine 80° cascade and somehow twisted this into climb a fine 20m 80° cascade (at Grade IV? ), knew when I saw it (and got onto it) that it was steep and must be it, but still half-expected (dreaded?) finding another bigger one above! So of course there wasn’t another monster lurking up there, but this little beauty was still exciting enough to show where Perroux was coming from when he wrote Every time I climb this route I can not help imagining Raeburn, without crampons, cutting steps on the 80° sections. To which I might add that, bar the crampons instead of unavailable nailed boots, you don’t need to imagine anything to marvel at the story of my old friend Hamish Irvine’s impressive 2006 centenary ascent in close to 1906 style! Anyway (to get back to our own tale), after giving some brief consideration to taking the right side of the icefall head on, discretion proved the better part of valour as I set off on a rising traverse to tackle what the old SMC Lochaber and Badenoch guide describes as an awkward ice bulge best climbed from right to left. So even getting to the position you see in the crux pitch photo involved a few steep and strenuous moves, but the angle shortly relented and I was soon pulling over the top and heading up another (now fairly crisp) snow section to get to a visibly kicked out stance (the best of the climb) and belay to a spike and big nut on the right wall. 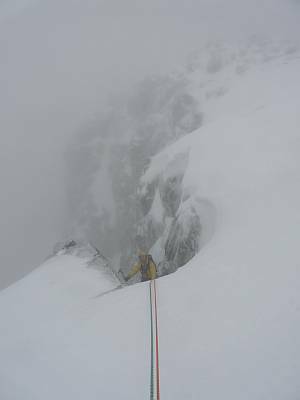 And it was good to bring up Jamie with the news that the (minimal) cornice was now visible a rope length or so above, the way to the plateau clear and the climb as good as done. Some slight confusion followed as the gully fanned out and we attempted to identify (without digging out the guide) the three recognised finishes to the climb. So what we initially took to be the easy left exit but couldn’t reconcile with a left-trending icefall to reach it later turned out to be SMC’s fine direct ice pitch and Perroux’s slight diagonal move left , which makes the logical option we took the SMC’s right finish and Perroux’s continue up the couloir and finish straight over the cornice. But, no matter, we both thought this the natural line and finished via a nice, short, icy groove to top out where you see Jamie in the final photo, and arrived on the plateau feeling very, very pleased to have snatched such a fine climb from the jaws of such an unpromising forecast. Despite our fears about heavy traffic on a classic climb known to be in climbable condition in the prevailing thaw, we had the gully to ourselves and saw nobody else from the CIC Hut to the Red Burn. 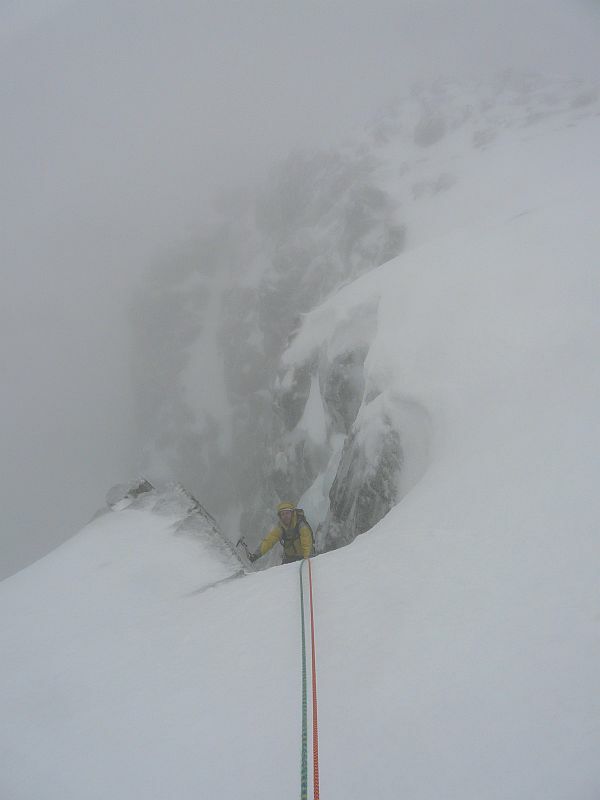 Although Jamie heard some voices below in the Coire at one point and I briefly heard others on topping out (possibly a party emerging from Comb Gully? ), the omnipresent cloud basically wrapped us up with a real sense of climbing in a world of our own. As it started to rain not long after we’d finished and packed up, and we were virtually walking in slush past the top of Number Four, we had no hesitation in opting for the Red Burn descent (where we caught up with a trio who’d done Tower Scoop), and just made the North Face car park without recourse to our torches. Since few runners were placed (six screws, two nuts and a couple of slings during the entire climb?) and little time wasted climbing, it must have been (as usual!) the setting up, changing over and management of belays that took the time. 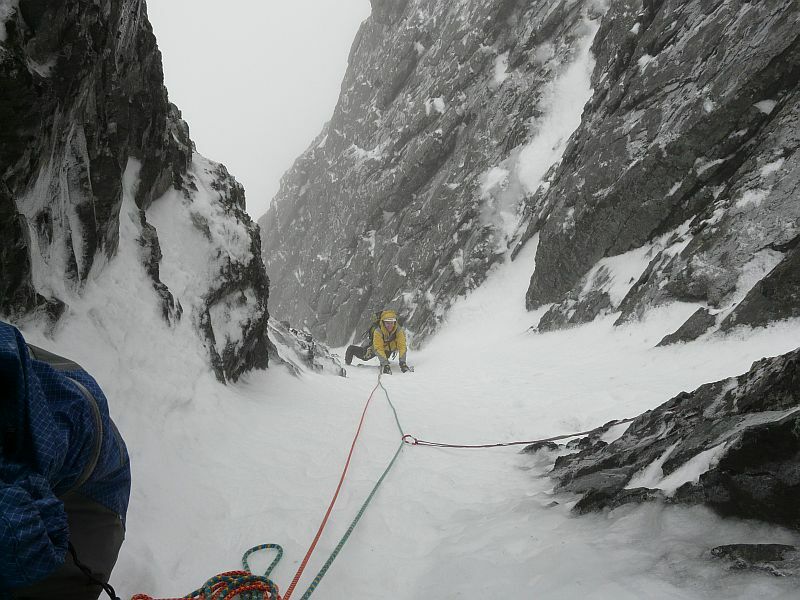 Climbed The Wand on Creag Meagaidh with Jamie Bankhead in February and Point Five Gully on the Ben with Johnny MacLeod in March, leading through on both to record my first leads at Grade V as well as first climbs at the grade. So it happened the season after Green Gully, and ‘what might have been’ now looks to be increasingly irrelevant!